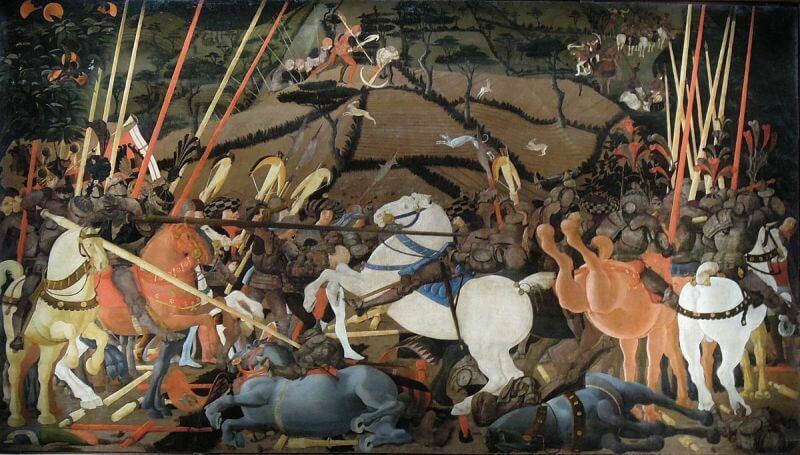 This table by Paolo Uccello preserved at the Uffizi is part of a trio of entries representing the highlights of the famous Battle of San Romano. The paintings came to the museum in 1784, but since they were all three very similar, it was decided to present only the best preserved and to sell the other two, now exhibited at the National Gallery and the Louvre. The scene represents the unhorsed by Bernardino della Carda, brave commander of Siena. The two armies, Siena and Florence, are painted in the foreground on either side of the table. Focal point of the scene is rather the white horse of Bernardino della Carda, who pierced by a Florentine spear loses balance and falls. The drama of the battle is almost entirely absent: the knights are in fact portraits in the manner of unarmed mannequins. The atmosphere of the painting suggests more a dimension of dream than harsh reality.